When it comes to two-wheeled practicality in an urban environment, it’s hard to beat a scooter. Perhaps that is why, in much of the world, you’ll see cities crawling with them. Scooters are easy to maneuver, easy to park, and most offer some cargo carrying capacity. They’re perfect for commuting or running out to pick up some groceries. 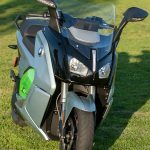 BMW has classified its three scooter models as urban mobility vehicles, with the C Evolution being the company’s only electric entry in the category. Outwardly, the C Evo resembles its closest sibling the BMW C 650 GT in many ways, but the similarities are only skin deep. 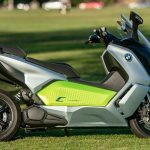 The C Evolution is a different scooter from the ground up. 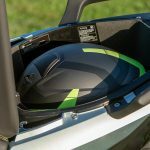 Instead of a tubular steel frame, the chassis is the die-cast aluminum casing that houses the batteries. Inside the casing are three battery modules, and each of these modules consists of 12 lithium-ion cells – the same ones used in BMW’s i3 car. 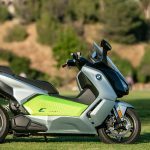 Although the C Evolution has been available overseas for several years, it is finally arriving Stateside with batteries that were recently updated to 94 Ah from 60 Ah, delivering a claimed range of 99 miles per charge. 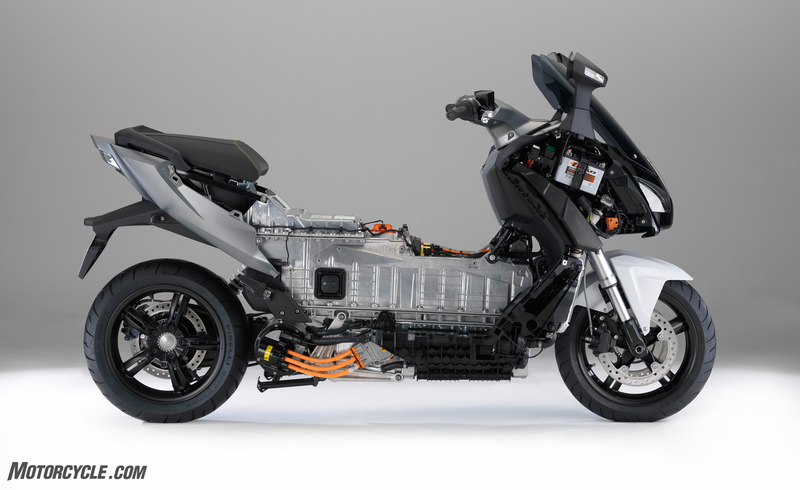 While it shares the BMW Urban Mobility family resemblance, the construction of the underlying chassis is new and serves a dual purpose of housing the battery modules. 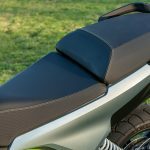 One of the ways that the C Evolution tells you it isn’t like other scooters is the Reverse Assist on the left handlebar. 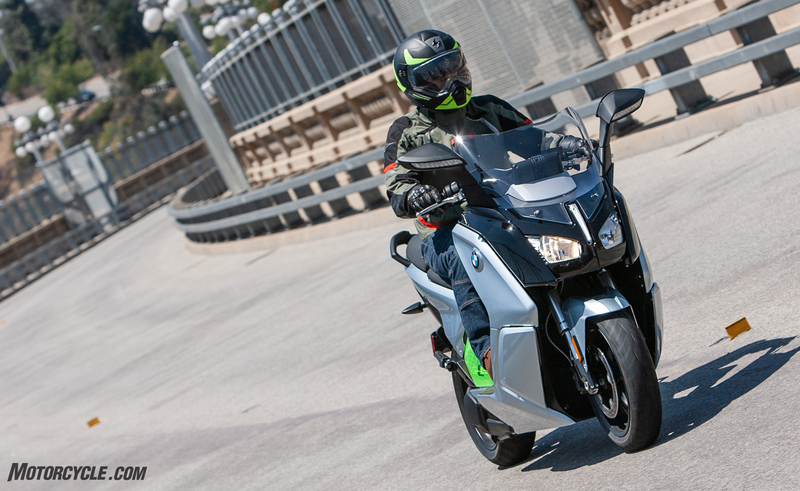 Hold it down and twist the throttle – carefully – to back out of your parking space. Get too heavy with the throttle, and you’ll find yourself backing up faster than you can walk and possibly end up on the ground. Still, Reverse Assist is a nice feature that you’ll use more often than you think. After all, the C Evo weighs in at a beefy 606 lbs. The C Evolution has the power and range to handle most of the duties required of an urban assault vehicle. 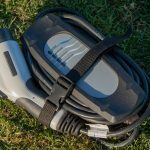 By now, anyone who has been exposed to electric vehicles knows that they typically have multiple modes to vary the balance between power and battery conservation. The four modes on the C Evo are: Dynamic, Road, Sail, and Eco Pro. Each mode has distinct characteristics, and I ultimately found myself alternating between Dynamic and Sail. In my initial miles on the C Evo, I didn’t like Dynamic mode, but I gradually realized I was using it all wrong. I was riding the way I would on an ICE (internal combustion engine) motorcycle where well-tuned fuel metering gives three engine states: acceleration, neutral throttle, and deceleration. With this limiting mindset, I treated the throttle as basically an on/off switch when moving from stoplight to stoplight in traffic. To my annoyance, rolling off out of neutral throttle initiated rather severe braking from the motor’s electricity regeneration. 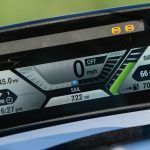 The TFT display is bright and easy to read. 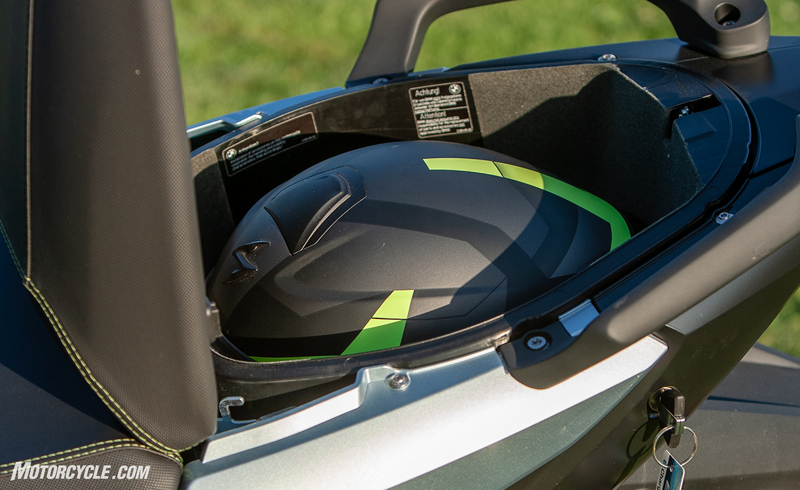 Riders can get all the information needed at a glance. 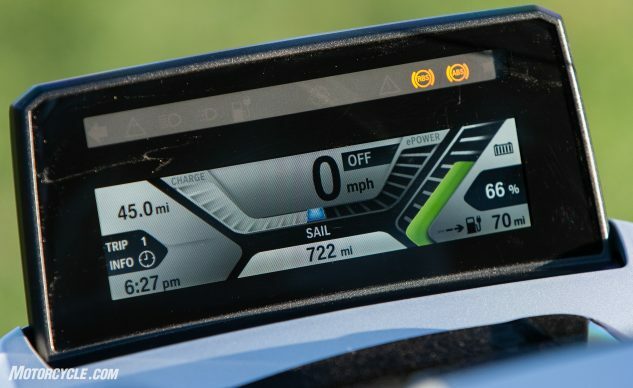 Here, the ride mode is Sail, the remaining charge is 66%, and the estimated range at current drain rate is 70 miles. 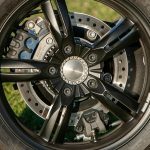 This prompted me to switch over to Sail mode, which lets the scooter freewheel when the throttle is rolled off. The tradeoff being that no electricity is generated, leaving the battery to run entirely on its contents until the brakes were applied. This suited my city riding style of accelerating away from lights and coasting like I would a two-stroke until it was time to brake. Once I took a few extended rides on the highway and on winding roads, I began to appreciate Dynamic mode. Where I’d been looking for consistent “engine braking” when the throttle was rolled off, I soon discovered I could tune the amount of deceleration by progressively rolling the throttle off. Essentially, I controlled braking that the regeneration applied with my throttle-hand without touching the brakes themselves. If I needed to slow down slightly for a corner, I just dipped out of the neutral throttle zone. A tighter corner received a more aggressive roll-out of the throttle. I had so much fun doing this that I ended up trying it on the Interstate to similar results. Lesson learned. The C Evo’s other two modes are Road and Eco Pro. Road is what the engineers must have thought of as the normal mode. The throttle response isn’t as sprightly and the regeneration not as aggressive. In other words, I rarely used it since Dynamic and Sail covered the types of riding I like to do. 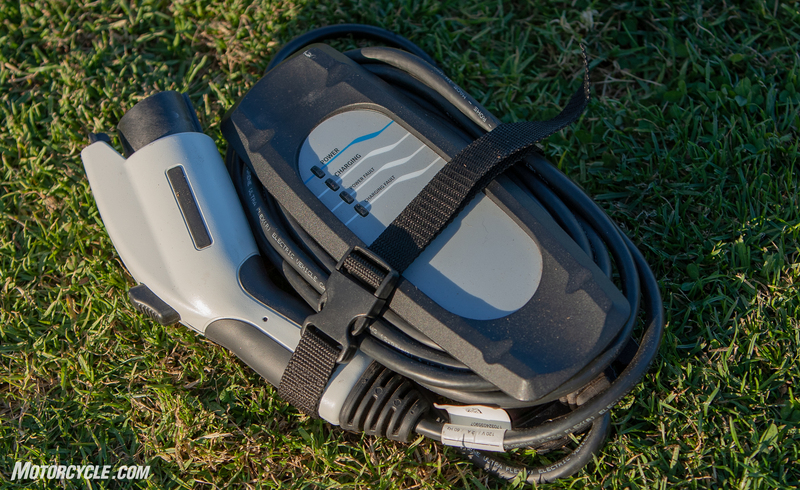 Eco Pro is designed to help the rider eek out as much mileage as possible from the battery’s charge. Power off the line is drastically reduced, and top speed is limited to 65 mph. Since Eco Pro made pulling away from stops tedious, I only used it when the battery got low and I was concerned about making it to a charging station. 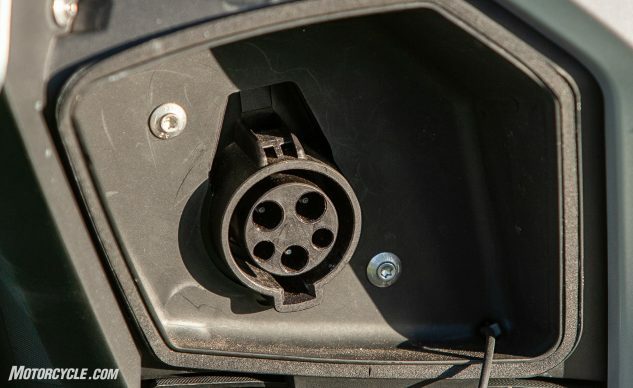 The inclusion of this plug on the C Evolution means that riders can charge their batteries at the public charging stations cropping up nationwide. I don’t know about the rest of the country, but around my slice of Southern California, Level 2 charging stations are popping up like mushrooms. Within a mile radius of my house, the city installed two stations to the north and a mall has two Level 2 stations (plus a DC fast charger) to my southwest. That’s the good news. The bad news is that they are frequently occupied. So, despite the growth in EV infrastructure, it is nowhere near as ubiquitous as the corner gas station. Only once, when I really wanted to top off my charge, could I not find an available charging station. Still, it is frustrating to have to go to a couple locations to charge. For my thinking, it’s not a big deal. Because of their limited range, EVs are mostly used for short-hop, everyday type chores, like commuting to an office or running errands around town. (Full disclosure, my wife and I have owned a VW e-Golf for the past couple years and have gone through the mental adjustment that is currently necessary for using an EV.) In my typical day, I never came close to using BMW’s claimed 99 mile range on city streets. In my case (since I work at home), I mostly ran errands with my average trip being less than 10 miles. With that kind of use, I could go a week without charging if I had to. Since I have a Level 2 charging station at my house, I was able to verify that BMW’s claims of over nine hours on a 110 V outlet and half that on a 220 V charging station were accurate. In either case, charging overnight makes the most sense if you have a fully drained battery. 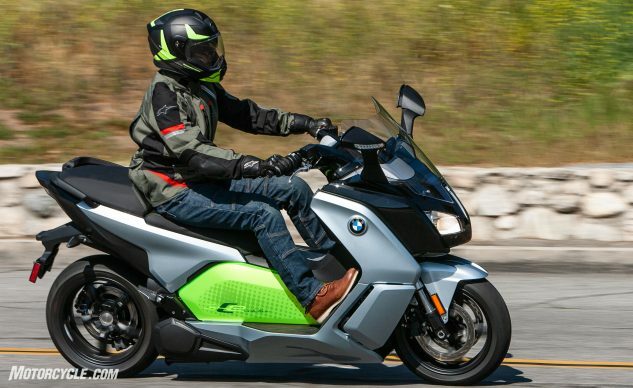 I did, however, attempt the completely unfair test I’ve applied to every e-motorcycle I’ve reviewed: I took it for a ride in the mountains – a trip that involves a short highway trip and extended uphill sections on winding mountain roads (meaning lots of acceleration and deceleration). Since the trip down the mountain uses very little battery, I make the turn-around point when the battery reaches 40%. 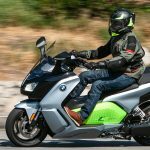 Although the C Evolution didn’t make it to my goal in this torture test, it did make it farther than any other electric bike I’d tested up to that point. I was even able to make it back home on that 40% charge with a few percentage points to spare after a round trip of around 40-50 miles. 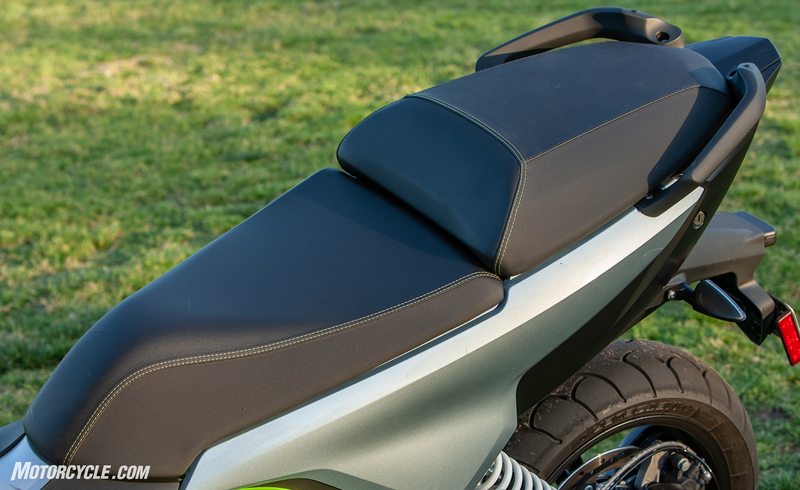 While the C Evo’s chassis is constructed around the battery box, it carries its weight and handles like the BMW C650GT we’ve tested in the past even with the all-new chassis. As noted before, the bike weighs in at a claimed 606 lb., and that ain’t light. Once underway, the C Evo hides its weight remarkably well. 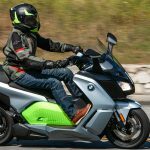 The only time that the weight becomes an issue is when the rider is pushing the C Evo or it tilts off-center at a stop – a problem exacerbated by the 30.1-inch seat height and the scooter’s width between the rider’s legs. The C Evolution shares the best features of BMW’s other urban mobility models: Sporty suspension, strong brakes, and seemingly limitless ground clearance. Out on the road, the 63.4-in. wheelbase helps to make the C Evolution stable at its 80 mph top speed. 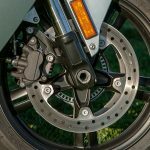 Although the 15-inch wheels contribute to quick steering, the BMW exhibits none of the nervousness sometimes encountered on similarly equipped bikes. 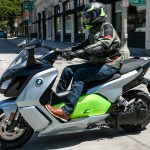 The snappy steering can be appreciated both when navigating through urban traffic as much as it can on a winding backroad – even if that isn’t typically where scooters are ridden. The 40mm inverted fork and the mono-shock do a decent job of handling road irregularities. 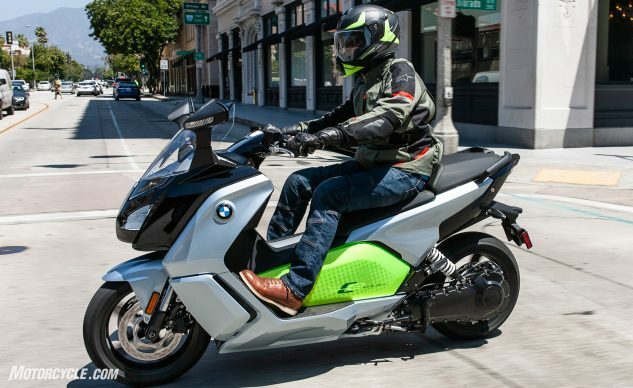 The ride is sporty but not overly taut – that is until you hit a sharp-edged bump. The suspension seems to lock up during these high-speed compression events. Otherwise, the ride is nice for a scooter. 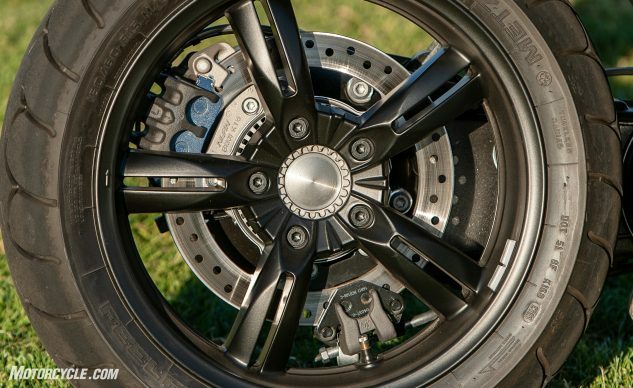 The dual 270mm disks and the two-piston calipers offer surprisingly forceful braking. 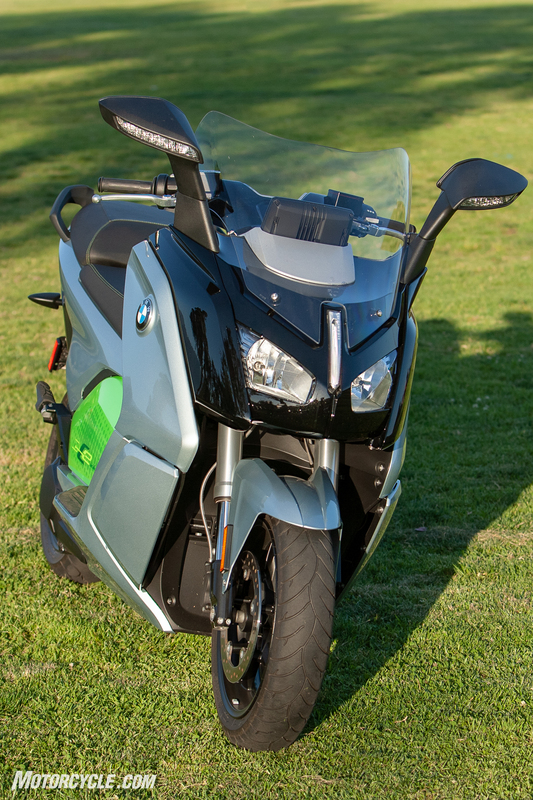 When it comes to braking, BMW scooters have always impressed us MOrons. A firm pull on both levers stops the C Evo courtesy of a pair of 270mm front discs squeezed by two-piston calipers and a single version of the same in the rear. The ABS is not overly intrusive, interceding just as the tires approach lockup. In fact, you can hear the ABS do its job as the tires start to howl just before the system kicks in. One area where BMW’s scoots have always excelled has been in ground clearance. The C Evolution is no exception, and it offers tons of lean angle when you want it. During my mountain road jaunts, I never dragged a thing at a decidedly sporty pace. 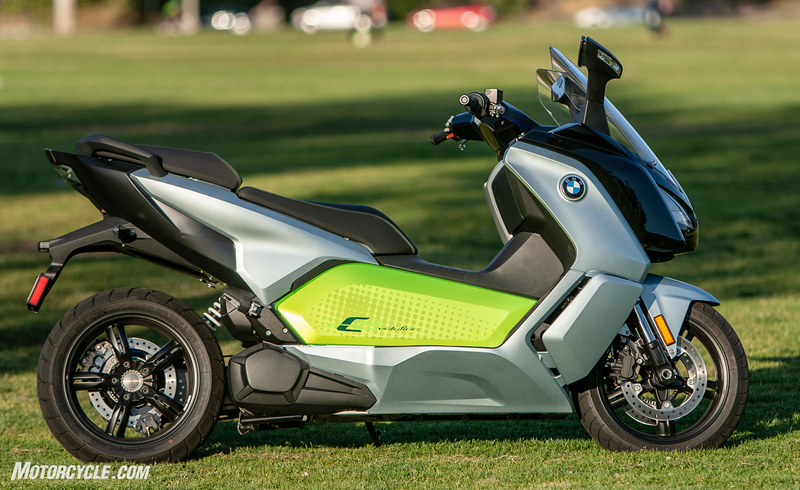 With typical BMW attention to detail, the C Evolution has a single-sided swingarm. 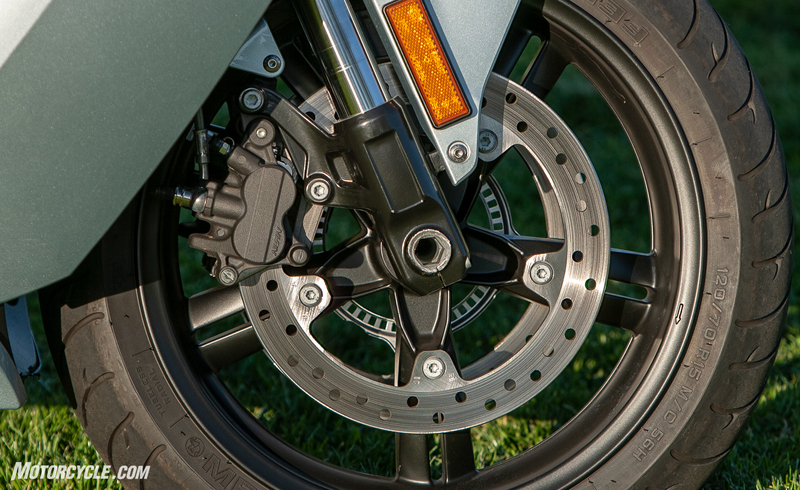 The caliper at the bottom of the disc is the parking brake, which is mechanically activated by putting down the side stand. The biggest shortcomings of the BMW C Evolution are the same ones that plague all current e-motorcycles: price and range. I’ve already addressed the range issue in saying that the C Evo handles commuting and urban transportation with aplomb. If you regularly need to ride more than 70-99 miles, this isn’t the machine for you. So, that leaves price. 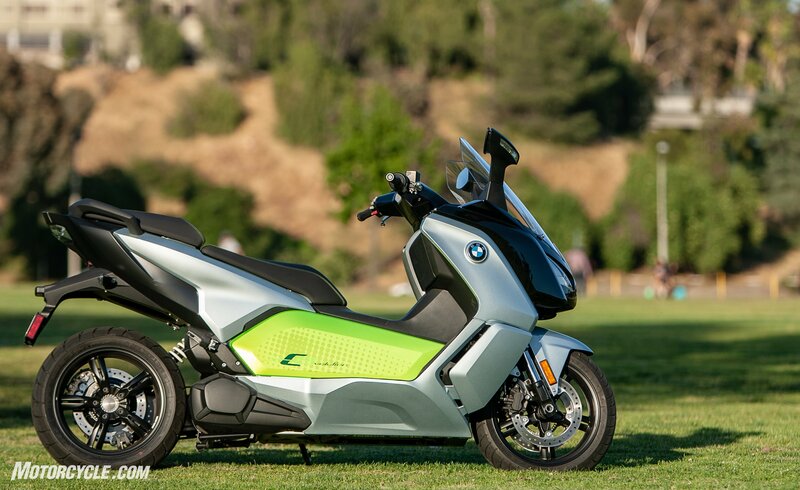 At $13,750, the C Evolution is $2,755 more than the BMW C 650 GT. 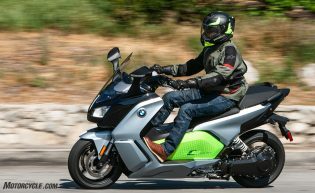 While it will take some time to recoup the additional purchasing expense from the lessened operating cost, with regular use, it is possible, and let’s face it, BMW owners tend to be a little bit more affluent than other motorcycle owners. 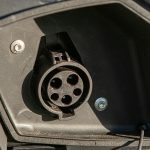 Perhaps the additional cost won’t influence the buying decisions of those who feel strongly about owning an electric vehicle for environmental reasons. The seat is quite comfortable, but it is also a little higher than people with shorter legs will like.